The internet and the way we browse the online is constantly changing. But did you know Google plans to literally start warning users about unsafe websites? 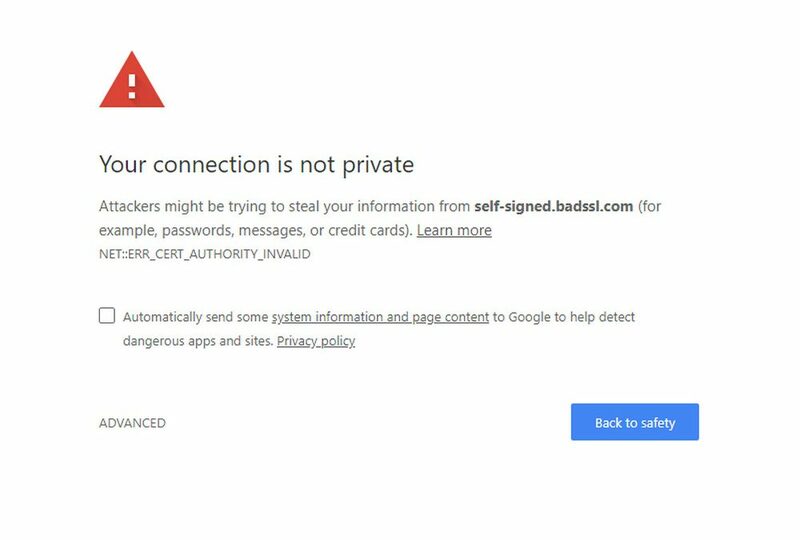 With hackers, creepy crawlers and intrusive internet service providers trying to “get you”, it might be a good idea to look into installing an SSL certificate. SSL stands for Secure Sockets Layer. And such a certificate might become mandatory real soon. For all business owners who collect sensitive data, having an extra layer of protection could spare them the embarrassment of being labeled as unsafe. Google’s unsafe website warning could affect all businesses, old or new. Although your website won’t become inaccessible, your visitors will be warned their own privacy might be at risk. Seeing how building trust with all potential clients is crucial if you’re looking for your small business to thrive, minimizing the risk of turning visitors away is recommended. In case you’re wondering what are the dangers of Google’s unsafe website warning, here are some insights that might help you understand why SSL certificates are a worthy investment. What would you do if you accessed a website and suddenly saw a warning that says: “This website might harm your computer”? It’s not uncommon for users to browse the online and simply assume every connection is safe. After all, if people would constantly be afraid of phishing attacks, they wouldn’t use Google to search for your business in the first place. But the fact that people ignore some basic principles doesn’t mean they’ll trust just any website. As soon as your website will be marked as unsafe, you’ll turn away your customers in seconds! Security plays an important factor in ‘convincing’ a customer they’ve found what they’re looking for and should stop their search. An SSL certificate can help you ensure your visitors your connection is safe and your company’s website is nothing short of professional. Often times, new business owners either put off or avoid increasing the security on their websites for years. But with new algorithms that “threaten” to go live, it’s safe to assume Google’s not kidding around this time. Increased web security is crucial nowadays. And Google’s unsafe website warning aims to encourage all webmasters to do something about it. If you’ve spent years trying to establish your brand, you should definitely consider installing an SSL certificate for your website! Google has emphasized the need for every website online to be safely encrypted. Their intention is to make the internet a safer place to browse. And in order to achieve their goal, they’re going to point fingers at all websites that are considered unsafe! For a webmaster who runs a small blog just for fun, not having an SSL certificate won’t affect their website much. Or at all! But business owners who collect even the tiniest bit of information about their clients will be labeled as untrusted and will lose credibility. Losing your credibility as a brand could result in your business losing a lot of existing and potential clients. When your small company’s reputation is at stake, you should do whatever it takes to climb back up the success ladder. And switching from HTTP to HTTPS is the first step towards proving your clients you care about their privacy. When users interact with your website online, they literally get to know you as a brand. And by showing your clients how safe it is to do business with you, you increase your chances of building a trustworthy company! Unencrypted web pages will soon be labeled as “not secure”. Among the possible ‘side effects’, you might lose customers to your competition and your brand’s reputation will suffer as a result. Unfortunately, though, that’s not all. Although the correlation between HTTPS and search engine rankings isn’t alarming, Google does tend to favor safe connections over indexing websites that are clearly unsafe. Although not having an SSL certificate for your business’ website isn’t a complete SEO disaster, Google’s intentions are as clear as day. Although they only use it as a lightweight signal, switching to HTTPS by installing an SSL certificate almost acts like a tempting SEO incentive. Installing that extra layer of security won’t push you to the top of the search query results though. But if you’re planning on making the ‘safe switch’ soon, know that redirecting to HTTPS could potentially affect your website’s rankings, in a good way. Do you need SSL on your site? We can install it for you.